Krabi, 29 November 2018 - AirAsia has fulfilled the dreams of young footballers with Journey D "Fly to Dreams the Football Clinic", giving more than 30 youngsters from Tambon Khlong Prasong of Krabi the opportunity to receive skill training from Coach Nattapong Kongsuk, Director of Freekick Football Academy Krabi, nutrition and physicality training from experts from the Faculty of Sports and Health Science of the Institute of Physical Education Krabi Campus and inspiration from former Thai national team players Tawatchai Damrong-ongtrakul, Datsakorn Thonglao, Supoj Jodjum as well as current team members Adisorn Promrak and Saharat Pongsuwan on 27 November, 2018 at the Kwai Football field in Tambon Khlong Prasong of Krabi, encouraging them to take part in the 2019 Krabi Cup. Mr. Chatupong Hongviset, Director of Ramp and Ground Equipment for Thai AirAsia, remarked that AirAsia was determined to bring Thai national football team players and trainers to help encourage and inspire young athletes in Tambon Khlong Prasong, where Koh Klang community is located. The village has close ties to AirAsia as 1 of the 4 pilot communities of the Journey D program, which developed it in terms of community tourism. The clinic was sure to have provided the youngsters with many new techniques and skills that they can use to develop themselves as well as Thai football. 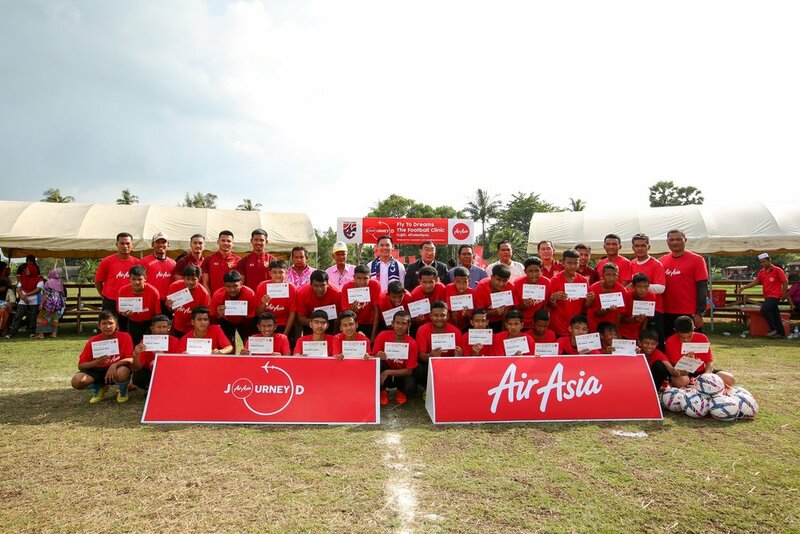 "The 'Fly to Dreams' program was initiated by AirAsia to support sporting from youths to the national level as we see sports as a way to connect with a diverse array of people and that football is a widely enjoyed activity. The football clinic in Tambon Khlong Prasong received much attention and we have to thank the Football Association of Thailand, the athletes, state agencies and everyone in the community for their support" Mr. Chatupong said.